Would my dog benefit from dog daycare? Yes.......If you have a dog that has a lot of energy or gets into trouble while you are at work. Do you have a puppy that must be supervised while you are away or an older dog that just wants to be surrounded by the company of others. In addition, many dogs with shy tendencies are given a wonderful, safe environment to gain confidence and interact with other dogs and people. All non-aggressive dogs can benefit from the fun and exercise that dog daycare provides. We provide more than just playtime for your dog - we also cater to you by providing add-on services for convenience since we know our customers are busy people. Need to drop your dog off before our doors open so you can get on your way to work? Ask about our Early Drop Off option. Reservations are required, so it is important to inform us in advance if you are planning to drop off early. Watch your fur-baby play all day on our High Def Web Cams. We provide daily communication and feedback on your dog's behavior while attending daycare. If we observe issues or behavior problems while in daycare, our daycare team can communicate this to our Dog Training department. Our trainers are readily accessible for further assistance. 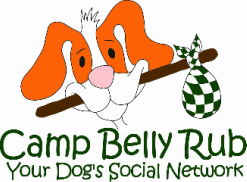 Here at Camp Belly Rub, we pride ourselves on delivering a comprehensive and complete day camp experience. We have a Puppy room, for your newest bundle of joy... you don't have to leave them home alone. All dogs must be current on DHPP, Bordetella, and Rabies. Puppies must have three DHPP booster shots and proof of Rabies must be provided by 6 months of age. Complete the paperwork before your evaluation. Arrive to your evaluation on time. Evaluations are scheduled at specific times of the day in order to maintain a structured day for the dogs and ensure they have time for all their scheduled activities. If you are running behind, please give us a courtesy call so that we can either hold your spot or reschedule for another time. Bring paperwork and vaccinations to your evaluation. Required vaccinations: DHPP and Rabies. 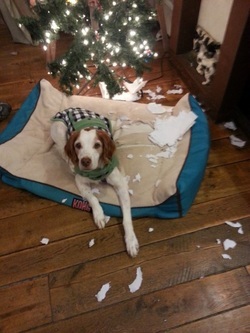 You may also have your vet fax them to our office before your evaluation.